Don't go it alone! Apply NFPA 70E® correctly and reduce your exposure to electrical hazards using the full-color NFPA 70E Handbook as your guide. Working around electricity can be deadly. 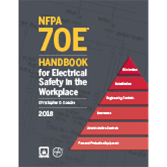 Understand how NFPA 70E is the key to ensuring an electrically safe working area using NFPA 70E Handbook for Electrical Safety in the Workplace®. Loaded with commentary and art, this comprehensive full-color resource helps you assess risks, determine hazards, select PPE, and use proven electrical safety-related work practices. If you're a manager or business owner, the Handbook helps you reduce the potential for significant liabilities involving loss of life, serious injuries, and damage to equipment due to electrical hazards. Everyone who works on or near electrical equipment, or who supervises someone who does, needs the life-saving guidance in the NFPA 70E Handbook. Many workers are unaware of how using NFPA 70E, Standard for Electrical Safety in the Workplace reduces their risks to electrical hazards. This Standard is not only important, it helps companies comply with OSHA 1910 Subpart S and OSHA 1926 Subpart K. Revised to reflect the latest edition of NFPA 70E, the new NFPA 70E Handbook offers explanations and advice to help you interpret the Standard and make the right decisions every day on the job. OSHA is the "what" and NFPA 70E is the "how." The 2018 edition NFPA 70E Handbook provides the "whys" and the support you need. The Handbook includes the entire 2018 NFPA 70E text plus exclusive commentary that explains requirements and their intent, breaks down tasks, and addresses different equipment and scenarios. Commentary is also provided on major updates, such as the modified arc flash hazard identification table [Table 130.7(C)(15)(A)(a)] that makes it easier to determine the likelihood that an arc flash could occur, and key changes to Article 320 that introduce voltage thresholds of 100 Vdc specifically for batteries and battery rooms. More than 150 full-color photos, charts, and illustrations bring safety concepts to life -- invaluable on the job and for worker training. Summary of Technical Changes at the beginning of the Handbook highlights revisions in the 2018 edition. Supplements include a list of requirement headings from the 2017 NEC® that directly impact the implementation of safety-related work practices, extracted material from NFPA 70B, Recommended Practice for Electrical Equipment Maintenance on electrical equipment maintenance, and guidance in writing a safety procedure. New to this edition is the "OSHA Connection" feature, which shows how OSHA's electrical safety standards correspond with certain NFPA 70E requirements. Also new for 2018 is the "Worker Alert" feature, which highlights crucial electrical safety information specifically for the employee. Avoid tragedies with electrical safety answers in the NFPA 70E Handbook. NFPA® Handbooks are your 'Roadmap to the Codes' with insights and graphics that answer code questions. View these sample pages for a preview of the valuable information you'll access including complete code or standard text; explanatory commentary highlighted in a second color; hundreds of full-color photos, charts, tables and illustrations to clarify concepts; and much more. The 2015 NFPA 70E® Handbook is your comprehensive source for knowledge about NFPA 70E, electrical safety, and compliance. Many facilities have the potential for significant liabilities involving loss of life, serious injuries, and damage to equipment due to electrical hazards. Yet many company managers and owners are unaware of the electrical risks addressed by NFPA 70E: Standard for Electrical Safety in the Workplace®. Using NFPA 70E correctly is the key to saving lives, reducing injuries, and satisfying OSHA mandates for electrical safety -- and that's why the NFPA 70E Handbook is essential. The 2015 NFPA 70E Handbook for Electrical Safety in the Workplace helps you understand the risks and make the right decisions. Revised to reflect a major shift in the 2015 NFPA 70E in how stakeholders evaluate electrical risk, the 2015 NFPA 70E Handbook helps you fulfill your role in mitigating electrical hazards. Commentary assists facility managers, electrical personnel, and business owners responsible for ensuring an electrically safe working area and complying with OSHA 1910 Subpart S and OSHA 1926 Subpart K.
OSHA is the "what" and NFPA 70E is the "how." The new NFPA 70E Handbook provides the "whys" and the support you need. The Handbook includes the entire 2015 NFPA 70E text plus exclusive commentary, printed in blue, that explains provisions and their intent, breaks down tasks, and addresses different equipment and scenarios. Summary of Changes at the beginning of each Article highlight revisions in the 2015 edition. Supplements include extracts from the 2014 National Electrical Code® (NEC®) on labeling and NFPA 70B: Recommended Practice for Electrical Equipment Maintenance on electrical equipment maintenance, and guidance in writing a safety procedure. Avoid tragedies by knowing how to correctly assess risks, determine hazards, and select PPE. Interested in other editions of the NFPA 70E Handbook? Use the drop down menu above to select the edition year you need.